Cleveland is famous for its richness of art and culture diversity. Art exist at every corner of the city. You can meet many initiative art groups on the street, and there are numbers of art workshops, various kinds of art museums in Cleveland. During our visit in Cleveland, we met several initiative art groups on the street. The issue is most of them do not have free and suitable space for exhibitions or music shows. The city needs a public open space for citizens and victors to take a closer look at the richness of artistic and culture diversity in Cleveland. The Detroit-Superior Bridge linked downtown Cleveland and Ohio City. Part of lower level of the bridge is current used as bike trail; it is a part of city bike trail. 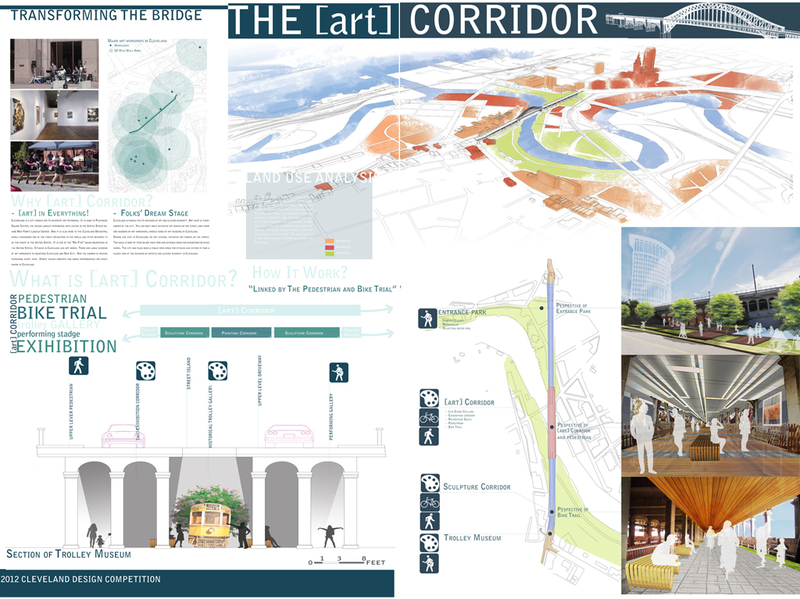 The linear space on the bridge could be a multi-functional space, include bike trail, pedestrian, stages, exhibition area, and trolley museum. Pedestrian is designed to use the central path of the lower bridge. 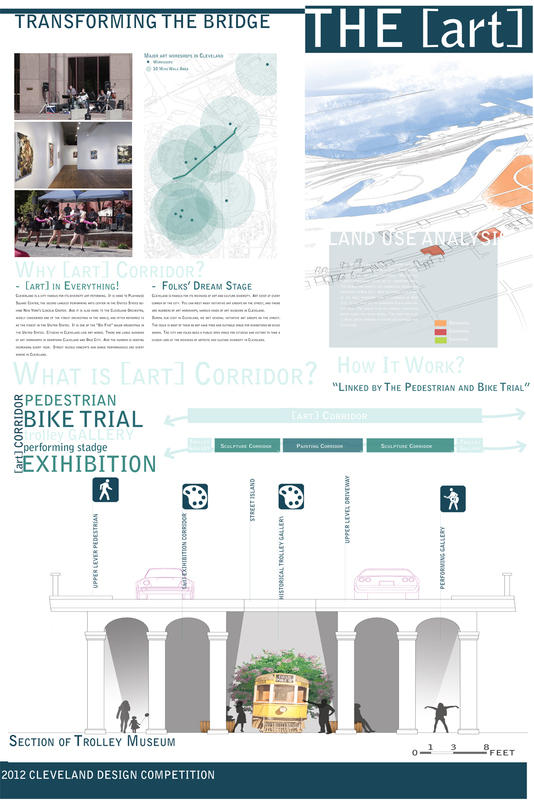 The linear space is also planned as an art corridor. The paintings, sculptures, and other artwork projects can be exhibited in this space. People of Cleveland and also the visitors could walk on the bridge and in the same time. The lighting of bridge will be re-designed for guiding and exhibiting. There will be two bike trials on both sides of the lower level of the bridge. So they will not disturb the exhibition. East Pool and West Catacombs will be used as trolley museums. Natural lighting will be introduced in these spaces from holes on the ceiling. The holes will be “street island” to organize the transportation. On both entrances, terrace green space will be designed as interactions of outdoor and indoor, and also as stages for performance. 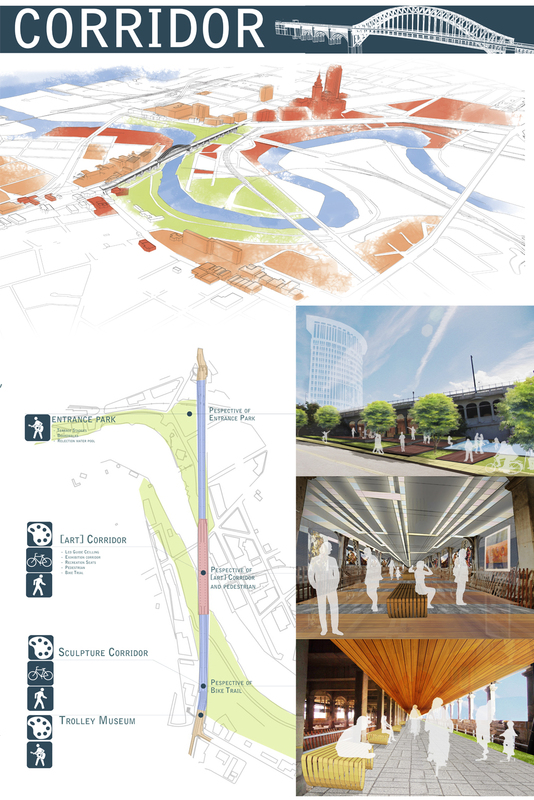 The whole bridge will be work as a pedestrian and bike trail to link the city, in the same time provide space for Cleveland art exhibition.